Donald Trump says he is "revoking" the Washington Post's press access at his campaign events because the newspaper is "phony and dishonest." In a Facebook post, the presumptive GOP nominee attributed the decision to the newspaper's "incredibly inaccurate coverage" of him. "Donald Trump's decision to revoke The Washington Post's press credentials is nothing less than a repudiation of the role of a free and independent press. When coverage doesn't correspond to what the candidate wants it to be, then a news organization is banished. The Post will continue to cover Donald Trump as it has all along -- honorably, honestly, accurately, energetically, and unflinchingly. We're proud of our coverage, and we're going to keep at it." Monday's announcement was an astonishing move by the Trump campaign, given the Post's status as one of the most respected newsrooms in the United States. But it follows a pattern. Trump has repeatedly refused to give press credentials to major news outlets when he disagrees with coverage decisions. Reporters who do not receive press credentials are sometimes still able to attend Trump events as members of the general public. But sometimes the denial of press credentials restricts access altogether. BuzzFeed, Politico, The Daily Beast, Univision, and The Huffington Post are among other outlets that have been blocked in recent months. Some journalists have described this as an emerging Trump "blacklist." From last September: "Why Trump is freezing out reporters"
The Huffington Post tweeted at The Post on Monday afternoon and said "Welcome to the club." The White House Correspondents Association, the Committee to Protect Journalists and Reporters Without Borders all issued statements criticizing the campaign's decision. Why'd Trump do it? He was apparently outraged by a headline on a Post story that summarized comments he made about the shooting at a gay nightclub in Orlando, Florida. "I am no fan of President Obama, but to show you how dishonest the phony Washington Post is, they wrote, 'Donald Trump suggests President Obama was involved with Orlando shooting' as their headline," Trump wrote. "Sad!" That headline was the result of an interview Trump gave to Fox News on Monday morning. "Look, we're led by a man that either is not tough, not smart, or he's got something else in mind," Trump said of Obama. "And the something else in mind -- you know, people can't believe it. People cannot, they cannot believe that President Obama is acting the way he acts and can't even mention the words 'radical Islamic terrorism.' There's something going on. It's inconceivable. There's something going on." Trump's remarks about Obama were widely interpreted to be sinister in nature. CNNPolitics described Trump's comments as a "conspiracy theory" and said it is "similar to how Trump talked about Obama when Trump was leading the 'birther' attacks against the president five years ago." The Post later adjusted its story to make the headline tamer. The headline now reads, "Donald Trump seems to connect President Obama to Orlando shooting." Kris Coratti, a spokeswoman for the Post, told CNNMoney that the headline was changed "shortly after it posted to more properly reflect what Trump said." "We did so on our own; the Trump campaign never contacted us about it," Coratti said. The Post -- like many other news outlets -- has had a simultaneously close and contentious relationship with Trump. 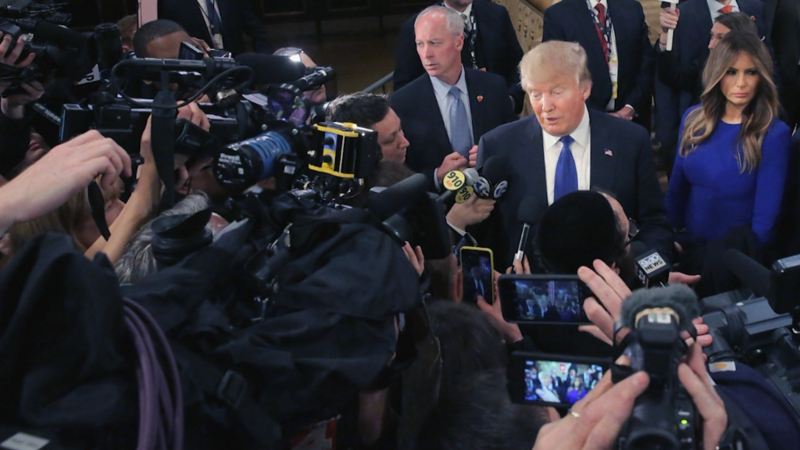 Its reporters have regularly interviewed Trump and published scoops about his campaign. But at the same time, the paper has been on the receiving end of the candidate's anti-press tirades. Trump said in December that the Post's owner, Amazon founder Jeff Bezos, bought the paper as part of a tax scam. Trump repeated the charge last month, saying that Bezos is "using the Washington Post for power so that the politicians in Washington don't tax Amazon like they should be taxed." Speaking at a conference earlier this month, Bezos decried Trump for trying to "chill the media." A wide range of press freedom advocates have said similar things about Trump's insults and actions, even as some GOP voters have cheered him on. Last week, for example, BuzzFeed DC bureau chief John Stanton said he was prohibited from attending Trump's primary night press event. The prior day, BuzzFeed had announced that it would refuse to accept Trump campaign ads. But the campaign's refusal to grant the web site press credentials dates back many months. Stanton tweeted that he "wasn't even let on the premises of Trump's golf course for his press conference." Trump's announcement on Monday was met with a chorus of opposition from members of the news media. Politico editor Susan Glasser called it a "violation of the basic right of a free press to report." David Folkenflik, the media correspondent for National Public Radio, said that Trump "loves the media's attention and hates the media's reporting." The Committee to Protect Journalists said in a statement, "A candidate for the highest elected office in the land doesn't get to choose what goes into a newspaper." It added that Trump's actions "provides a ready made excuse for authoritarian leaders to crack down further on independent journalists."